I decided to forgo the usual Purse Picks this week to bring you a fun little Friday giveaway from local D.C. designer Pink Pomelo. You don't mind too much, right? Of course not! Because today I'm giving away this adorable, dainty bangle that I've been rocking for weeks now (full outfit posts here and here). I love the unique octagonal shape and the different colored stones that surround it makes it easy to wear with so many colors! And while it's great on it's own, it also plays well with other arm candy. Each Pink Pomelo piece was inspired by creator Kristin Miner's trip to Thailand. They all have their own names and meanings. This one, named Dara, means "star." I also love the story of her vision for Pink Pomelo, which can be found here. The giveaway is open to U.S. residents only and ends at 11:59 p.m. on Tuesday, July 16. I did all three steps. 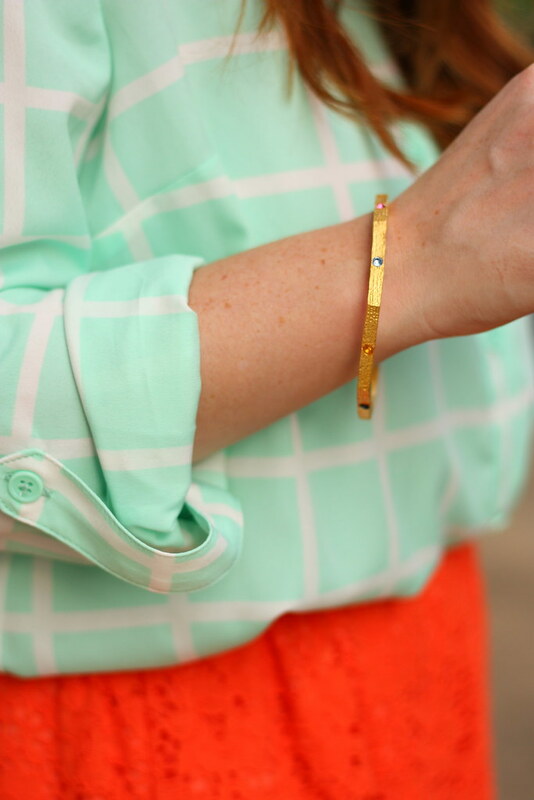 I noticed that bangle this week in your outfit post and love how delicate but trendy it is! Looking good! Thanks for a great giveaway! I liked Pink Pomelo and you on FB. That bangle is very lovely and I hope I win! Love the bangle and thanks for the opportunity to win! Liked both pages on Facebook too! Love the bracelet! Love your blog!! Love it! I'm in. I'd totally add that to all my baubles. Done, done and done! I love this dainty bracelet - definitely perfect with an arm party or alone! very cute! would be a great accessory for work. Love it! I'm really into geometric jewelry lately. Loving the shape of that bangle! I'm really into pieces that are a little more dainty these days.